Well, we are definitely in the dog days of summer in more ways than one. To an old Southerner like me, the Dog Days of summer meant that the temperature and humidity was going to be almost unbearable each day. According to my mother, it also meant that any cut or scratch would not heal during this miserable period of time, and she was correct as always! However, at Riverview, Dog Days have another meaning also. This is the time of the year that Moss begins to solidify his pointing dog strings. By now, we have determined which dogs are gamers and which ones are just trying to collect a meal ticket. We have trained, traded, and drafted new dogs into the rotation. Moss told Cader IV last week that he is still in the market for about 15 more good hunting dogs, and that he has good leads to fill out his quota. In my early years at Riverview, dog buying was one of my many jobs. I don’t remember the names of any of the dogs I purchased, but I still remember the tightest pair of hunting britches I ever saw on a female dog trainer who sold me a dog. I couldn’t recall the dog’s name when I got home with him, and Pop was none too pleased with me. He reminded me about the simple operation we performed on trouble making male dogs, and he had no more problems with my attention to details after that. 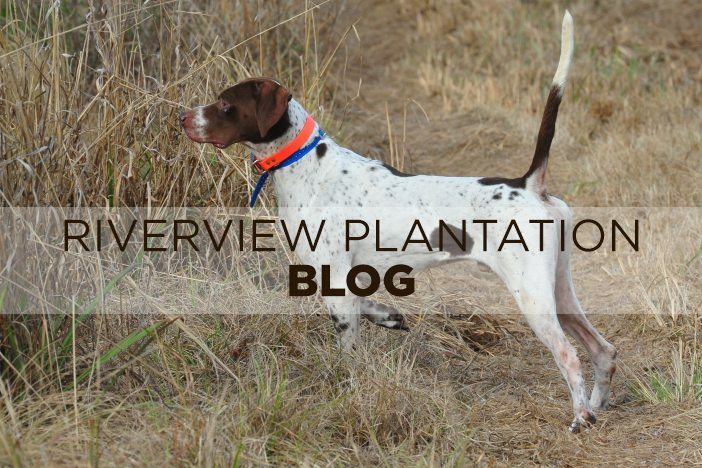 As I have mentioned several times, we are very excited about our introduction of the English Cocker flushing and retrieving dogs into our program at Riverview. Chuck and Jerry have worked real hard on this program, and we are thrilled with their progress. These little dogs are amazing. I intend to own one myself one day if I am still able to shoot anything for them to retrieve. My beloved old Lab will just be too old to subject to field work any longer. These Dog Days of summer will eventually give way to the scent of autumn, cooler nights, football season, AND hunting season. I can’t wait !